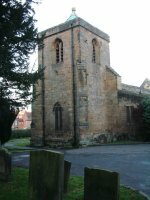 The Parish Church of St Mary the Virgin, the oldest of the three church buildings in the Parish, stands on the Kirkhill approximately one mile out of the town of Morpeth. 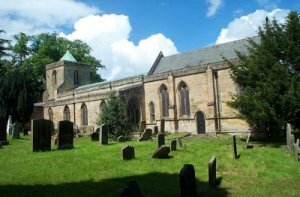 With its natural position and architectural features it is one of the finest and largest 14th century churches in the County of Northumberland. St Mary's was Morpeth's main Parish Church until the 1840s, when church attendance was falling, due in no small part to its location, on the southern boundary of the town. The walk, particularly in winter, was proving too much for parishioners, so it was decided to build a new and more suitable church in the centre of the town. The building of St James was begun in 1844 and completed in 1846. 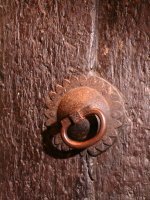 This short guide to the church shows some of its features, but to appreciate fully its beauty, a visit is highly recommended. Many people have played a part in establishing a church on this ancient site of Kirkhill. There was an unknown evangelising monk, companion of Aidan or Cuthbert. Ranulf, the grandson of William de Merlay, one of William the Conqueror’s officers, whose reward for quelling the rebellious Northumbrians was the Barony and lands of Morpeth. 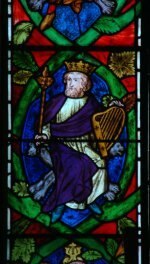 There was a group of monks from Fountains Abbey in Yorkshire where Ranulf had sought shelter in his travels, who at his invitation came north to build Newminster after the Conquest. 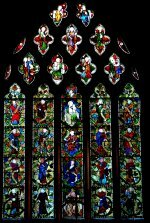 The stone masons in the employ of the Baron may also have played their part in founding the church. Despite the devastation wrought by Scandinavian, Scottish and Cromwellian vandals and thanks to the faithful restorers of the 14th, 17th and 19th centuries, the present church, dedicated to St Mary the Virgin, stands witness to the gospel which has been proclaimed here for almost 900 years. However recent study has suggested that there may have been Anglo Saxon activity on the same site. TOWER: Some of the oldest architecture of the church. A buttress of the east end of the south aisle rises to its full height without any stages, then dies away into the wall in a very long setoff; this is a sign of the Transitional Period 1160 - 1190. The north side contains the stairway to the tower. The masonry is probably of two periods, the lower late 12th c., the upper 14th c. PORCH: This was added to the main building probably between 1500 - 1600. On the east wall is a list of Rectors from 1129. There are numerous graffiti monks from ancient days. A small niche, which may have held a lamp, can be seen in the wall. PRIESTS DOORWAY: South side of the chancel, a beautiful Early English door of fine workmanship 1200 1272. The deeply undercut string course of the wall runs over the doorway as a hood moulding, giving deep shadows. The fittings, shown here, are of excellent quality. LYCHGATE This was erected by the Fenwick family of Netherton in 1861. 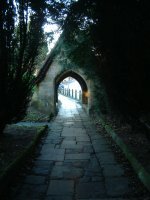 A line of Yew trees stretches from the Iychgate to the entrance of the church on the south side . They were traditionally thought of as an emblem of immortality. Most ancient burials ore found on the south side of the church because people disliked the shadow of the church on the graves. NAVE The main arcades with pointed arches are late 12th century. The pillars of the south arcade are shorter than the north arcade and there are tracings of mediaeval painting in red and black on some. In the north joint of the chancel arch is a squint or hagioscope, probable for the priest to see the High Altar and coincide with the mass. NAVE (West) View to the tower area, which is the oldest part of the church in the Transitional Early English style, 1160-1190, with a fine vaulted roof (see picture below). Several masons’ marks are to be found in the church giving a positive link with the builders of Newminster Abbey in 1188. The exceptionally fine stone vaulting in the tower roof, with Decorated groining. Christ in Majesty is holding an orb in his left hand depicting three continents, all that was known to the medieval world. 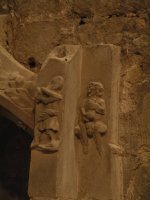 The lower figure inscribed on the left is St Denys of France, protector of cattle, and St Blosius, protector of sheep, is on the right. 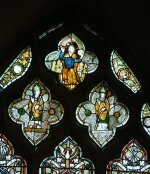 The Woodman window was restored in December 2000. One of the finest carvings in the church, this carved angel, playing a stringed instrument is one of the head stops on the south side of the Chancel. 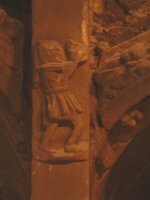 Detail of one of the stone figures decorating the arches of the sedilia in the Chancel. Two further figures on the sedilia arches. Note the evidence here of possible damage during the Cromwellian period. Emily Wilding Davison (1872 - 1913) is remembered as the woman who died by "throwing herself" under the hoofs of Anmer, King George V's horse on June 4, 1913 at the Epsom Derby in support of the British suffragette movement. She was trampled and died a few days later, never having regained consciousness. She is is buried in St Mary's the church yard and her gravestone bears the WSPU slogan, "Deeds not words". Emily Davison was born in Blackheath, London, and had a university education, obtaining first-class honours in her final exams at Oxford, though women were not at that time admitted to degrees. She joined the Women's Social and Political Union (WSPU) in 1906, and immediately involved herself in their more militant activities. She was arrested and imprisoned for various offences; went on hunger strike and was force-fed in Holloway prison, where she attempted suicide as a protest. Emmeline Pankhurst believed that it was her experiences in prison that brought Emily Davison to the conclusion that only the ultimate sacrifice would bring any success to the Suffragettes. Emmeline wrote in "My Own Story" that Emily decided that only the loss of life "would put an end to the intolerable torture of women." Film of the incident shows her stepping out in front of the horse, Anmer, as it rounded Tattenham Corner, with Davison carrying the banner of the WSPU. But instead of stopping, Anmer trampled her, knocking her unconscious. Eyewitnesses at the time were divided as to her motivation, with many believing that she had simply intended to cross the track, believing that all horses had passed; while others reported that she had attempted to pull down the King's horse. She died four days later in hospital, due to a fractured skull. Emmeline Pankhurst described Emily Davison's death in her autobiography 'My Own Story', as follows:. Emily Davison clung to her conviction that one great tragedy, the deliberate throwing into the breach of a human life, would put an end to the intolerable torture of women. And so she threw herself at the King's horse, in full view of the King and Queen and a great multitude of their Majesties' subjects. Mary Richardson was with Emily Davison at the Derby in 1913. Mary Richardson wrote about the incident in her book 'Laugh a Defiance'. A minute before the race started she raised a paper on her own or some kind of card before her eyes. I was watching her hand. It did not shake. Even when I heard the pounding of the horses' hoofs moving closer I saw she was still smiling. And suddenly she slipped under the rail and ran out into the middle of the racecourse. It was all over so quickly.